Victoria Peak, also known as “The Peak”, is one of the most popular tourist attractions in Hong Kong. It offers great views of the city, entertainment, dining, and shopping. The Peak sits on the top of Mount Austin, the highest elevated mountain on Hong Kong Island. From the top of Mount Austin some of the best views in all of Hong Kong can be seen. 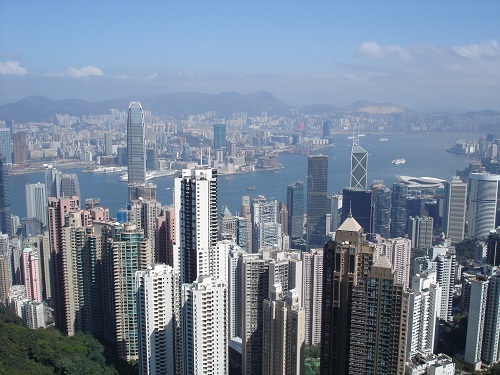 These views include the Victoria Harbour, Kowloon, and smaller, nearby islands. Walk around and enjoy the beautiful scenery from the lookout points found throughout The Peak Hong Kong. You’ll notice that the temperature at the top of Victoria Peak is a bit cooler than the rest of Hong Kong. This is due to the higher elevation on the mountain. This cooler temperature makes living on Mount Austin very desirable. Houses in this area are very expensive and known as the place where rich people live. And with such a nice view from a home in this area, you can understand why. To get the most out of your trip to The Peak Hong Kong, visit an hour or two before sunset. This way you get great views of Hong Kong during the day and at night. Now you’re probably wondering “how do I get up to the top of a mountain?” Well there’s a few ways to get up to the top of Victoria Peak. There’s a road on the mountain, making travel to The Peak possible by car, taxi or bus. But the most unique way to get up to the top is by Tram. The Peak Tram is a Tram system built back in 1888 for transporting passengers from Central all the way up to the top of Victoria Peak. The Peak Tram provides the fastest and most scenic route up to the top of the mountain. 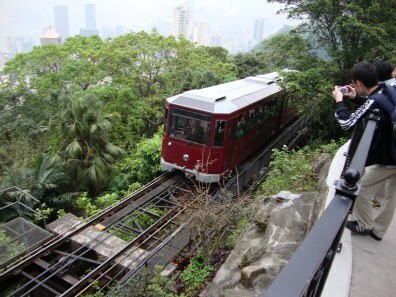 This form of transportation is one of the oldest and cheapest ways to get up to the top of The Peak Hong Kong. Tickets for The Peak Tram can be purchased at either the upper or lower Tram Terminus stations or from travel agents in advance. 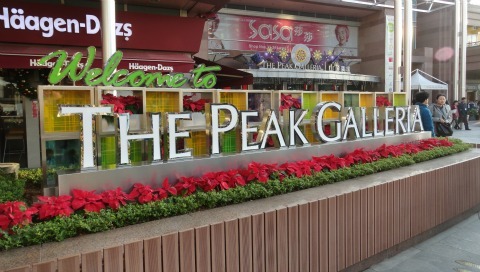 An interesting spot to visit before or after your ride on The Peak Tram is the Peak Tram Historical Gallery. This gallery displays all sorts of special memorabilia from The Peak Tram and its operation since 1888. Some of the items in this gallery are over 100 years old. Be sure to see the replica of the first Tram made for use on the Tramway. Peak Tram Historical Gallery is located at the Peak Tram Lower Terminus and is free to all Peak Tram passengers. The most convenient way to get to The Peak Tram is to go to Central MTR station. From there it’s just a short walk to The Peak Tram Lower Terminus. Once you’re at the top of Victoria Peak, you’ll find all sorts of things to do. The Main attraction at the top of Victoria Peak is The Peak Tower. The Peak Tower is a building with a very stylish, unique architectural design. It looks like a flattened letter “U” sitting on top of a letter “J”. You can find a picture of The Peak Tower at the top of this page. Inside The Peak Tower you’ll find the Sky Terrace 428, Madame Tussauds, shopping at Peak Market, and restaurants. Some of the restaurants at The Peak Tower are worth eating at just for the great views of the Victoria Harbour! 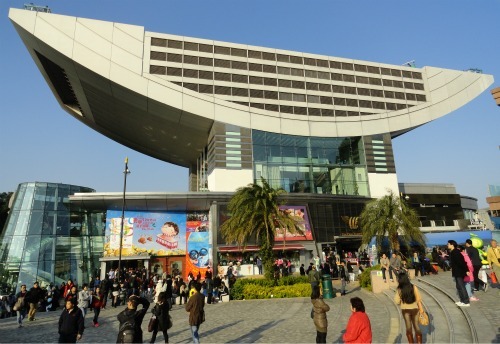 The Peak Galleria is another shopping centre located right next to The Peak Tower. It offers more interesting shops, restaurants, and nice views of the Victoria Harbour. Shops at The Peak Galleria are quite similar to the ones inside The Peak Tower. These two shopping centres have lots of interesting stores filled with souvenirs, gifts, clothing, and many other interesting items. Since the Victoria Peak is a major tourist attraction, prices for things will usually cost more than other places in Hong Kong. The catch is that some of the items for sale at The Peak Tower and The Peak Galleria may only be available here. So if you see something unique in a store up here, you may want to buy it. I didn’t buy too much from these malls, but it was nice to walk through all the stores. It gives you something else to do while visiting the Victoria Peak. The Sky Terrace 428 is a viewing platform inside The Peak Tower that gives you a 360 degree panoramic view of Hong Kong. At 428 metres above sea level, The Sky Terrace 428 is the highest viewing platform in Hong Kong. For the best experience at The Sky Terrace, go up before sunset for a panoramic view of Hong Kong during the day and at night. A new addition to The Sky Terrace is The Sky Gallery. The Sky Gallery is a collection of historical photos with information on what things were like a long time ago in “old Hong Kong.” A great way to learn about Hong Kong’s history. If you plan to take The Peak Tram up to the top of Victoria Peak and visit The Sky Terrace, you can buy the Peak Tram Sky Pass. This pass entitles you to a ride on The Peak Tram and entrance to The Sky Terrace at a discounted price. Madame Tussauds is a world famous wax museum chain with museums all over the world. Madame Tussauds Hong Kong is the home of wax sculptures featuring famous International and Hong Kong stars. These wax celebrities are separated into 6 different themed areas with special effects to make the experience that much more real. There are even interactive displays where you can join in on the fun yourself. 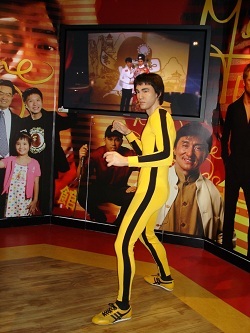 A few of the famous celebrities found in Madame Tussauds Hong Kong include Bruce Lee, Jackie Chan, Barack Obama, Lady Gaga, Johnny Depp and Yao Ming. Over 100 more famous people are on display at Madame Tussauds Hong Kong. Anyone who enjoys nature will be excited to learn that there are several hiking trails around Victoria Peak. These hikes range anywhere from 10 minutes to 1 hour to complete. The Peak Hong Kong is one of the most iconic and historical tourist attractions in Hong Kong. If you only see a few attractions while staying in Hong Kong, I would recommend visiting The Peak for its amazing views, its history, and to experience The Peak Tram for yourself.